For some reason, maybe because of the heroic effort I have made of late to get our new apartment completely unpacked and set up, Daisy agreed to let me out of the house for a few hours Monday morning to take what is perhaps my favorite walk in Queens, which is through Flushing Meadow Park, the Queens Botanical Garden, Kissena Corridor Park, and Kissena Park proper. 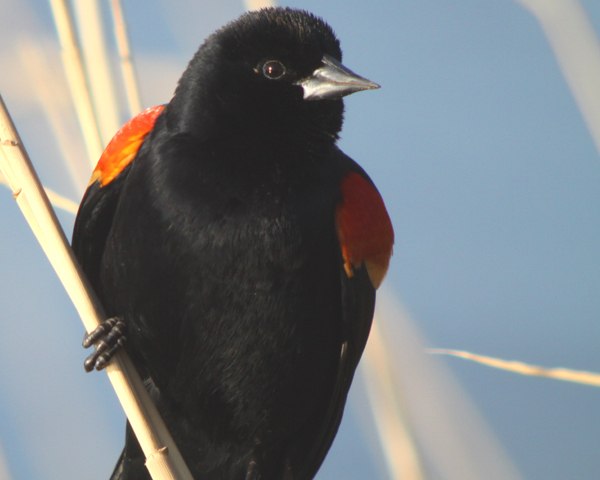 On a good day the number of birds that one can spot is amazing, mostly because one traverses a variety of habitat, including two lakes, open ground, fields, scrubby and bushy habitat, several stands of pines, and some stands of hardwoods. When I did this walk in early April of last year (to say nothing of November of 2008) I had some nice birds, and I was hoping that with a nearly cloudless sky I would be able to both see some nice birds and take advantage of the good morning light and get some worthwhile digiscoping done. 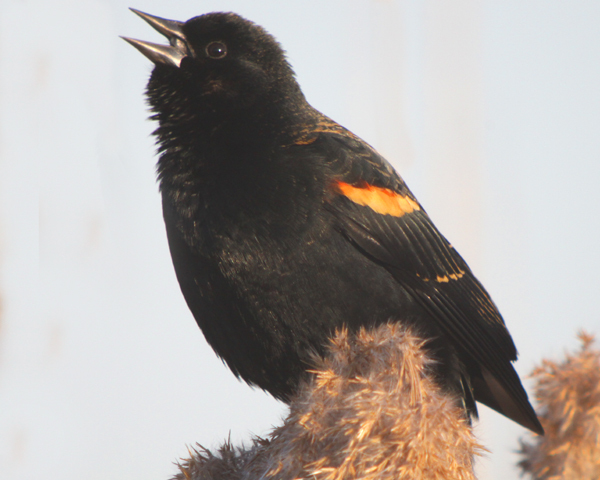 Of course, once I got to Flushing Meadow Park, it was just like Saturday evening; I couldn’t resist taking some shots of the now-ubiquitous Red-winged Blackbirds singing from the phragmites. Besides Red-winged Blackbirds I was also serenaded throughout the morning by American Robins, Song Sparrows, Northern Cardinals, and White-throated Sparrows. And though I enjoyed the passerine symphony the other highlights of the morning were not perching birds. In fact, I mostly focused on waterbirds for awhile, including my first Wood Ducks in Queens for the year, and my first Ring-necked Ducks and Pied-billed Grebe of the year anywhere. 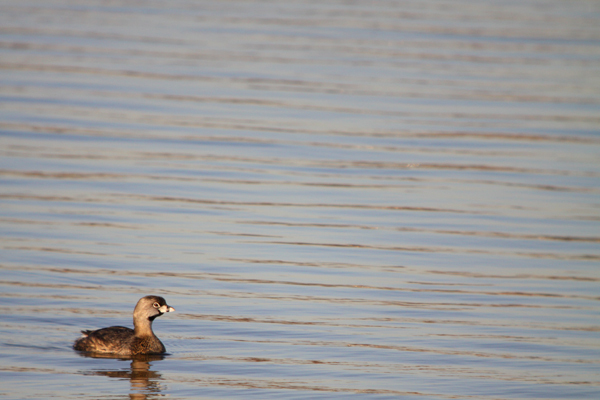 Of course, other waterbirds more commonly seen at Meadow Lake were around as well. 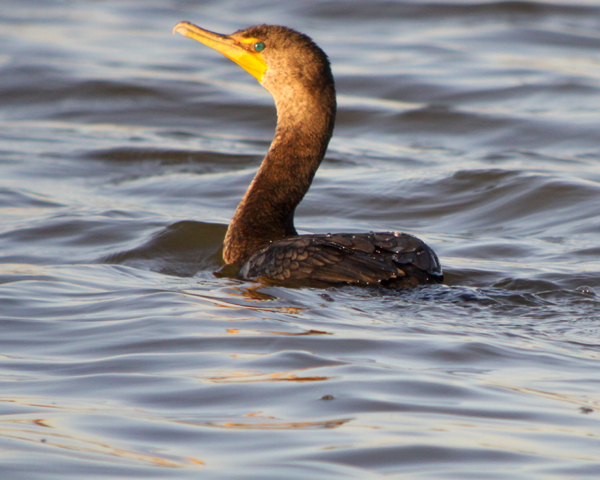 Hundreds of Brant, scores of Canada Geese and Mallards, a pair of Hooded Mergansers, a bunch of American Coots, and six Double-crested Cormorants, one of which is pictured below. 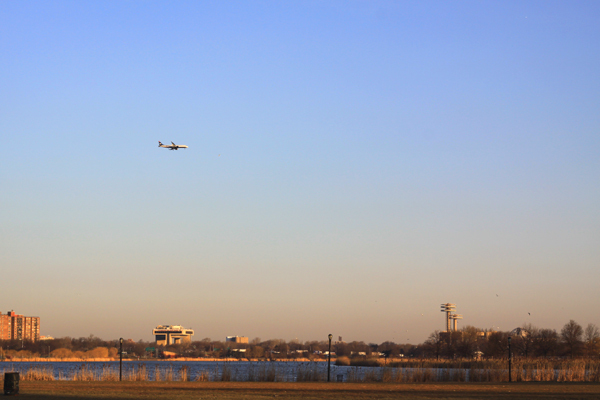 From Meadow Lake I continued north, crossed the Long Island Expressway, and then made my way northeast until I found the footbridge over College Point Boulevard that takes on to the Queens Botanical Garden. You can imagine my disappointment when I arrived at the gate to the garden to find it locked. Doh! A detour around the garden was in order, but I persevered, and in no time found myself starting to stroll along Kissena Corridor Park. 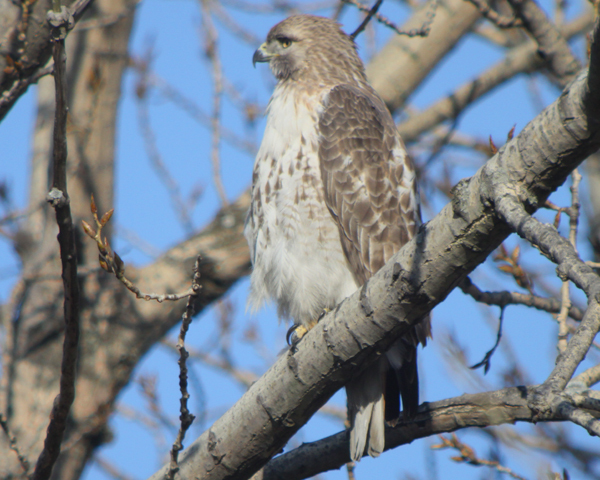 I didn’t get far before a Red-tailed Hawk perched up in a tree distracted me. As I scoped it some teenagers on their walk to school (I hope) stopped and asked what I was looking at. I explained and offered them scope looks, at which point they went from being unimpressed ultra-cool teens to grinning fools. Maybe I helped nudge them on the path to becoming birders? Anyway, once they left and I was about to continue on my way myself I heard a familiar high-pitched call that I at first ignored but as it became louder and closer I started to look around, and, sure enough, my first five Killdeer of the year landed in the baseball field next to where I was looking at the hawk. Nice! After that there was no point in continuing on so I smashed my lens, walked to the bus stop, got on the Q65, took it to the Q46, and walked the three remaining blocks home. Well, that isn’t entirely true, as I had Kissena Park proper to bird still, but I didn’t really add anything of note to the day list. Also, I didn’t intentionally smash my cheap 50mm Canon lens, and this time I bought a warranty anyway, so the fact that I managed to break my third 50mm lens in fifteen months of digiscoping isn’t that big of a deal. Anyway, what I am clumsily saying is that after the pheasant the birding day was essentially done and I headed home earlier than expected with the hope that Daisy will let me out again soon. This post was originally published on 09 March 2010, but we hate to keep posts this good buried in the archives! Being home earlier than expected is certainly a good move to ensure Daisy’s future tolerance. Nice bird pics. As a zoologist, I can never fully enjoy the sight of a pheasant and must condemn your joy (but deep down in the core of my birder’s soul, where no one is watching or listening, I think they are great to see anywhere, not only in East Asia 😉 ). And people used to view me with sympathy when I was a birder who had the misfortune to live in The City (I moved out just last week). I think Canon needs to develop some Corey-proof lenses. I’m looking forward to further reports on the Queens ravens. 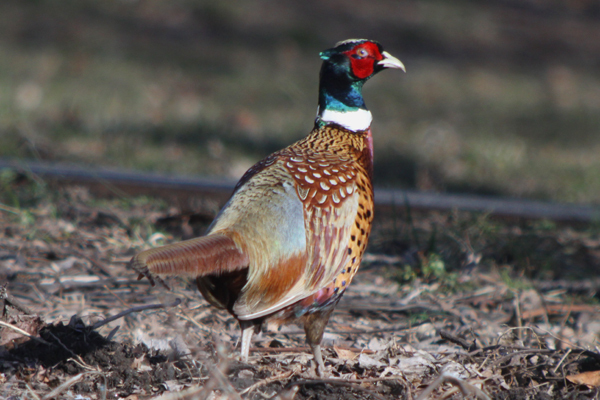 @Jochen and Charlie: Everyone loves pheasants. Just like everyone loves peacocks no matter where they are. 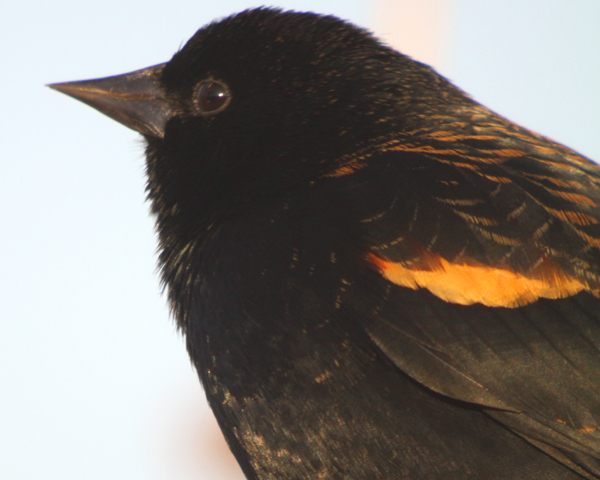 @Opposable Chums: New York City is great birding! @Matthew: There will definitely be some…and, for those who don’t know, Matthew is referring to the raven nest in Queens that I “found” today (found is in quotes because I was just following up a word-of-mouth report). Fantastic shots–thanks for posting. I’m always amazed by how many birds come through here; while I’m not great at spotting them, I’m happy to see when others do. Still a classic. Just saw the pheasant and his mate Thursday morning in the corridor, but no chicken lady.